But many more, she noted, chart their own unique courses. “This celebration of pro bono resonates with the mission of Georgetown Law,” Treanor said, noting that 1L students start their public service careers with Orientation Week projects and continue through the Law Center’s top-ranked clinics; summer fellowships; graduate fellowships such as those with the low-bono firm started by Georgetown Law, DLA Piper and Arent Fox; externships; and more. 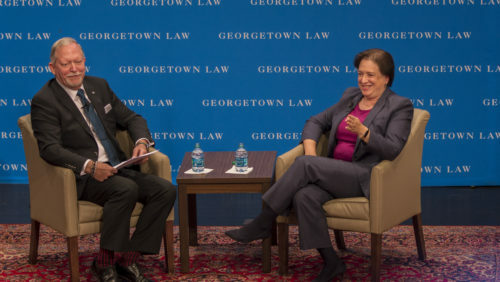 It would be dangerous, Kagan said, to view the justices as just an extension of political processes. Half of the Supreme Court’s cases are, in fact, decided unanimously.